Newport Beach, CA – April 16, 2018 – (GuitarPR) – Guitar Business Radio, the Podcast for the Business of Guitar continues to broaden its appeal and grow its audience with the release of Episode 10 – Bruce Forman Gets Serious. The weekly show is celebrating its double-digit milestone, by expanding the guitar business discussion to players as well. From the beginning, the show has described its audience “from guitar builders to guitar players and everything in between.” The business aspect is the common connection. 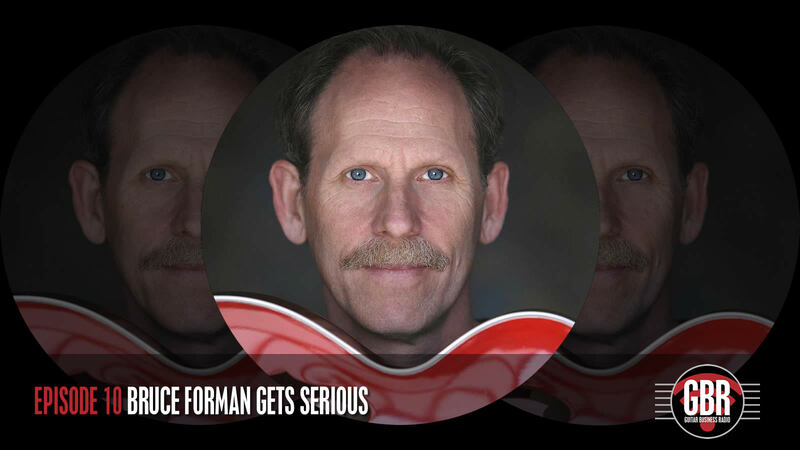 Episode 10 features an in-depth interview with the multi-talented guitarist, Bruce Forman, in which he candidly discusses in detail his experience on the business side of things and what it takes to make a career work and keep a happy heart at the same time. “Because we’re a business show, and our target audience is large and diverse, we have to be able to deliver content that cuts across that terrain reasonably well. So, with whomever we’re talking to, or whatever we’re talking about, our goal is always to deliver content that our entire audience can get value from one way or another,” explains producer and host of GBR, Jeffrey D Brown. GBR is available on iTunes/Apple Podcasts, Stitcher and Google Play Music. For more information or to listen to the show, simply search for Guitar Business Radio or visit the show website at https://guitarbusinessradio.com. GuitarPR can help increase sales and grow your business with affordable PR, market consulting and structured media services for guitar-related businesses.